D&D Machinery has served through out the nation. We are present in San Antonio Texas, Evansville & Lafayette IN, Tupelo Mississippi, Freemont CA, to mention a few. 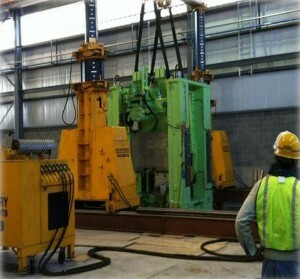 D&D Machinery is a licensed bonded contractor from east coast to west coast. We are always happy to provide detail of our abilities and confirmation of locations. As a part of the family-owned business, Dan Combs has been involved since the 1970s. After graduating with a degree in economics, Dan began his fieldwork as a rigger and as an estimator. Since taking over the responsibilities of president, Dan has focused on growing a successful family business by hiring the best professionals in the industry, using top-of-line equipment and servicing a wider range of customer needs. Coming from Denver Bob brings stamping press expertise with many years of experience. Raised in the industry and coming from a family owned and run business Bob knows what it takes to make things happen and how to place the proper man-power and tools on the job to get it done. If you need press installation, repair and any heavy rigging support Bob is your expert. With a background as a licensed electrician focused his carrier in the Industrial sector with years of experience in the Industrial field of automation with international travels to the far east. Michael knows how to plan, schedule, organize and make the projects safe with his skills and background knowledge. When the word robotics comes up Michael Brewer is the guy that steps up to take control! Directing the office with the variety of things happening at D&D is a skill that is handled daily by Megan. Part of the family Megan came to D&D Machinery after graduating from Center College and hearing the rigging lingo for years she keeps everyone on the paper work detail and confirmation track. For the office mechanics Megan is your contact. With a BS in Mechanical Engineering (Texas Tech) and a MBA from Loyola University, Luke is our go to guy for details to confirm the science of what we do. Working in the fabrication field, meeting the standards of the military contractors and travels through out our nation, Luke brings the technical and specific details to our installation and rigging aspects. Luke is a Texas native and knows what it takes to make things happen and has the experience and background to confirm it. Being raised in the industry so specific as the services D&D Machinery performs Melissa keeps the ship tight on documentation of what is going on and the cost impact of what is happening. Melissa a University of Kentucky graduate who brings the know how and pride of getting the job reporting and keeping our staff up-to-date.